Enquiries about design commission services. Enquiries about the status of your order. Providing feedback or comments about the products or services. Sending photos of any miniatures on which you have used CitadelSix Custom Design decals. Sending suggestions for any heraldry decal designs or decal sets that you think would be popular with war-gamers. 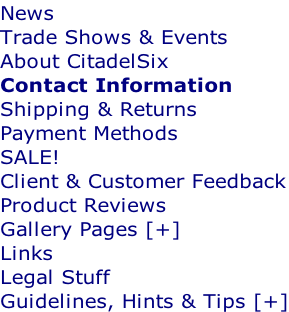 The postal address for CitadelSix Custom Design can be found in the footer ribbon of any pages on this website.